(Nanowerk News) Tiny rod-like single crystals that act as miniature dual-color barcodes have been synthesized by A*STAR researchers and co-workers. The researchers have demonstrated the potential of these barcodes for two very different applications: anti-counterfeiting measures and cell tracking ("Multicolor Barcoding in a Single Upconversion Crystal"). So-called lanthanide-doped upconversion materials are highly promising for applications against crime and cancer as they have adjustable morphologies and tunable output wavelengths — they can also be fabricated by inexpensive processes that are easily scaled up. To date, single-crystal nanocrystals made from these materials have been impractical as multicolor barcodes because their tiny size makes them too small to be observed using conventional optical microscopes. 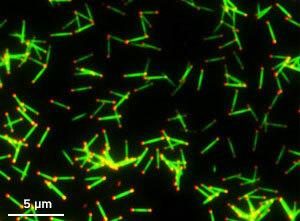 Xiaogang Liu at the A*STAR Institute of Materials Research and Engineering and co-workers based in Singapore, China and Australia overcame this problem by synthesizing different-colored microscale rods that have red, green or blue tips (see image). These rods are made of a lanthanide-doped upconversion material, NaYF4, and are sufficiently long that their colored tips can be readily resolved using a standard microscope. As a first step, the researchers controlled the lengths of the NaYF4 microrods by varying the doping concentration of gadolinium. They then adjusted the color of the microrods by varying the doping concentrations of ytterbium (Yb3+) and erbium (Er3+) ions. The colored tips were simply a different phase of the same material as the microrods and were fabricated using a minor variation of the same procedure. Different combinations of microrod and tip colors were made by adjusting the doping concentrations of the microrods and tips. Liu and team demonstrated the potential of these miniature barcodes for anti-forgery measures by producing two transparent security inks: one that contained dual-color microrods with green centers and red tips and a control ink that contained green microrods. When illuminated by an infrared laser beam and viewed by conventional microscope, printed patterns produced using the two inks are essentially indistinguishable under low magnification and have practically identical spectral properties. However, when observed under high magnification, the red tips of the microrods in the non-control ink are clearly visible, allowing the two inks to be easily distinguished from each other.